For those who prefer a thinner wedding ring, such as brides with an engagement ring the titanium 4mm high polish dome wedding band is a fantastic choice. Created using grey color grade 2 titanium with a high polish finish and measures 4 millimeters wide. The wedding band shines so well it can be mistaken for the much, more expensive platinum metal rings. The best part is the price of our wedding band is much much lower than a platinum wedding band. Our titanium 4mm high polish dome wedding band is 100% hypoallergenic so that you never need to worry about fingers turning green. The ring is made with comfort fit design so wearing it each and every day is always a pleasure. Titanium has the strength of steel and the weight of aluminum. 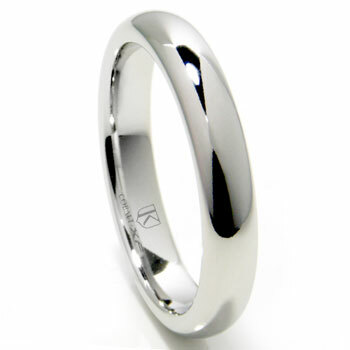 Those who own a titanium wedding band are confident knowing that their wedding ring is one of the stronger rings crafted today yet is so lightweight it is stunning. This ring was a replacement for the band my puppy lost/ate. I love the simple design and high polish finish. It is light weight, good size. I am sad my first band is gone, but I truly love this band. I also love that it didn't break the bank! Perfect size, perfect fit, Light weight and lovely. Actually better then expected.